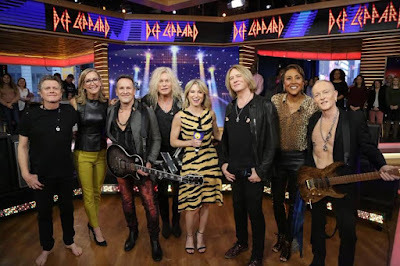 Def Leppard performed their 1987 smash, “Pour Some Sugar On Me”, during a March 27 appearance on ABC-TV’s Good Morning America ahead of their induction into the 2019 Rock And Roll Hall Of Fame this Friday. The UK rockers will be inducted by Queen guitarist Brian May at the 34th annual ceremony; despite being eligible since 2005, Def Leppard are gaining entry on their first ballot consideration - to qualify for recognition, an individual artist or band must have released its first single or album at least 25 years prior to the year of nomination. Rock Hall ballots were sent to an international voting body of more than 1,000 artists, including current living Inductees, historians and members of the music industry. Factors such as an artist’s musical influence on other artists, length and depth of career and the body of work, innovation and superiority in style and technique are taken into consideration. The 2019 Rock And Roll Hall Of Fame Induction Ceremony will take place at the Barclays Center in New York on March 29 and recorded for later airing by HBO.